Buckle up, folks. Let's get ready for a month's worth of Nashville. I recently traveled to the city (8 hour drive from Morgantown) to see my friend, Brittany. While there, we embarked on a week's worth of gluttony, adventuring and boozing. 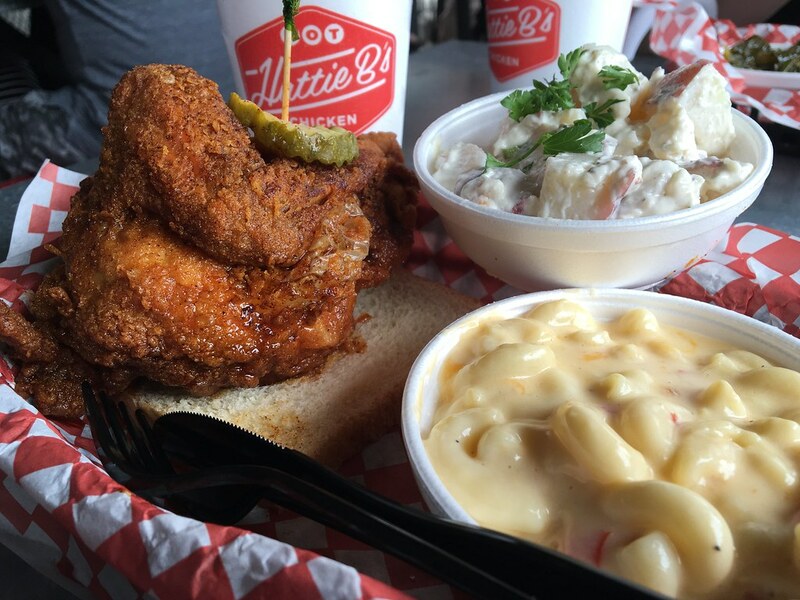 The first stop, after the long drive: dinner at Hattie B's Hot Chicken. Hot chicken is a regional specialty in Nashville, so I had no fewer than at least three places (maybe four) that served it on my wish list. It is generally accepted that the originator of hot chicken is the family of Andre Prince Jeffries, owner of Prince's Hot Chicken Shack. 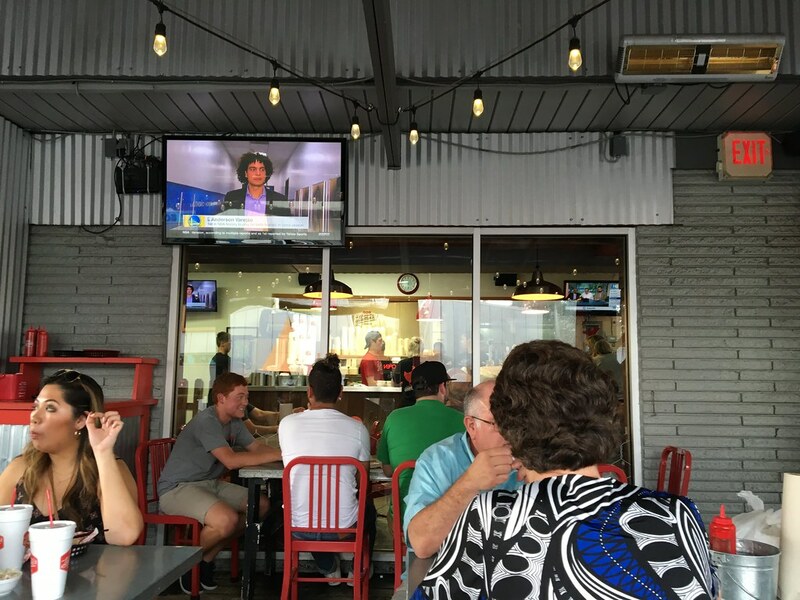 She has operated the restaurant since 1980; before that time, it was owned by her great-uncle, Thornton Prince III. 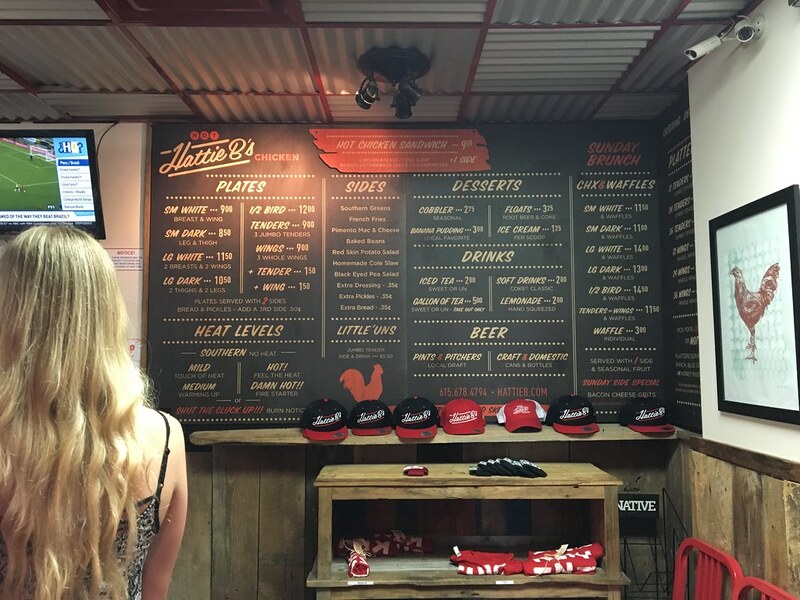 Although impossible to verify, Jeffries says the development of hot chicken was an accident. Her great-uncle Thornton was purportedly a womanizer, and after a particularly late night out his girlfriend at the time cooked him a fried chicken breakfast with extra pepper as revenge. Instead, Thornton decided he liked it so much that, by the mid-1930s, he and his brothers had created their own recipe and opened the BBQ Chicken Shack café. 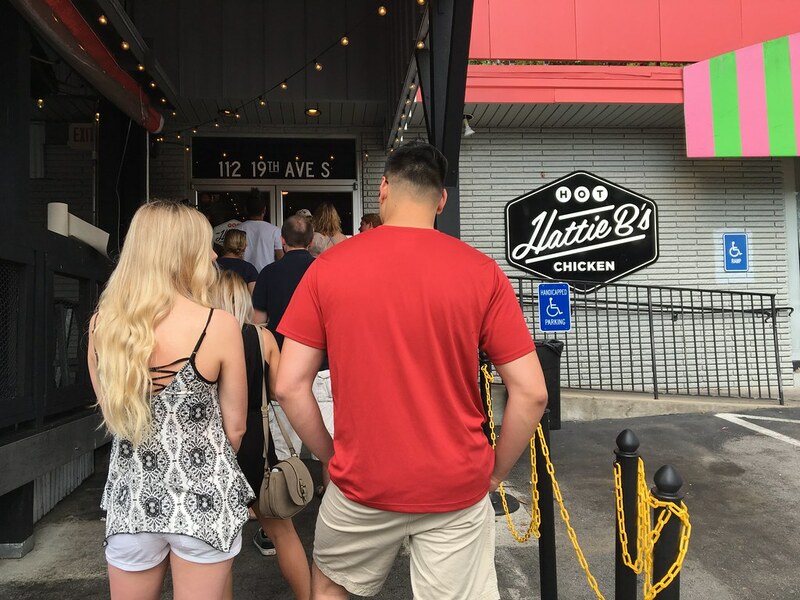 Hattie B's has a bit more of a polished look compared to some down-home chicken shacks and has found itself on all the must-try hot chicken lists for its welcoming environment and easy locations. The branding is on-point with the red accents carried throughout the decoration (and the chicken!). When we arrived, we were greeted with a small line. No worries, it moved quickly. Once we got close enough to the counter, I was able to make out the menu and figure out what I want. Dark meat or white meat? White. Large or small? Small. I ended up with a small white meat plate, which came with a breast and wing (mild please) and two sides: I went with pimento mac & cheese and red skin potato salad. After placing our order, we found a table outside and awaited our food. My chicken arrived atop a piece of bread with pickles speared through the top. This plump, juicy chicken breast packed a little cayenne heat in that crisp deep-fried breading, but nothing too toxic - for that, I was thankful. It was flavorful and went along perfectly with my sweet lemonade. My favorite part was as the chicken settled into the bread, the bread soaked up all this flavor and spice and was just delicious. Pimento mac & cheese was so good - how could it not be? And the cool potato salad added a welcome break from the hot temperatures otherwise. This was tasty! And, with it being my first, real hot fried chicken, I was impressed and couldn't wait for more. Fortunately, I had options already lined up!